We had a mad hatter baby shower for my bestest pal. 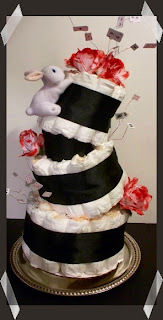 I just had to try to make a diaper cake that had the topsy turvy style. This is what I came up with. This mad hatter baby shower had painted roses, a white rabbit, candy and teacups. It was lovely! This diaper cake took me longer than any other. I tried several ways to get them to topsy using diapers. I had to scrap that idea and go with cardboard tubes. I covered each one with the same thick black ribbon that's around the diaper rounds. You can't see the separator on the bottom from this angle but it's there. Painted roses were done by Aurora (my little crafter). It's just acrylic red paint on cheap fake white roses. The cards are scrapbook embellishments. I used glue dots and sandwiched the wire in between two cards. I always think it's fun to have stuff made out of diapers at baby showers. It's cheesy, sure, but it's fun. :D Happy crafting! I think you can make a wonderful Dr. Seuss themed cake like that!